Machine learning (ML) is an aspect of artificial intelligence that deals with computer programs learning by themselves with little to no human involvement. Typically, large amounts of unstructured data are provided to the computer program; using pre-provided ML algorithms, this data is then analyzed for unique patterns and results are then generated. 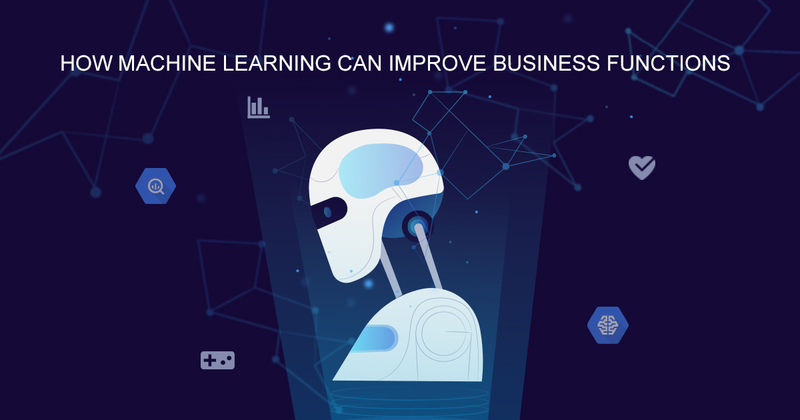 Depending on the nature of the business, the results generated from the ML algorithm is used to enhance decision-making capabilities or improve business processes / functions such as personalized recommendations when shopping online. An essential aspect of ML is the ability of the program to independently learn from and utilize previous computations or analysis in generating result output when provided with fresh data. Even though ML has been available for quite some time, there has been a renewed interest in its utility as businesses look for ways to improve their business processes as well as gain a competitive advantage over their rivals. There are several ways that businesses have successfully incorporated ML into their operations; these vary depending on the industrial sector of the business. The rest of this post looks at some of the ways that ML is being used by businesses in varied sectors of the economy. This post also looks at how our certified Google Cloud engineers at Zazmic can help businesses deploy ML applications in their business operations. Algorithmic trading: This is the automated purchase or sale of shares when specific market conditions are met. ML applications are used to constantly monitor the conditions for the desired market conditions so that necessary actions can be taken. Risk management: Financial institutions use ML to assess the creditworthiness of current as well as prospective clients. An analysis is done of clients’ ability to repay loans, and even how current or future economic circumstances may impact the clients. This information is used to categorize clients as high, medium, or low-risk and dictate how much as well as what kinds of loans can be offered. Personalized recommendations: Retailers use ML algorithms to drive their search and recommendation engines. The ML application analyzes the purchasing history of the customers and then provides individualized recommendations of other products that may be of interest to them. Supply chain management: The ability to accurately forecast the demand for products is essential to the success of any retailer; there are lots of variables that can impact customers’ demand for various products. ML applications are able to monitor these variables and their impact on the demand for specific products. This helps retailers plan accordingly so as to prevent a shortage or oversupply of products, both of which are financially detrimental. Price optimization: Using ML, retailers are able to decide the optimal prices for their products. They also use ML to decide what kinds of discounts, sales, or promotions that would generate the most interest from their customers. Predictive maintenance: Equipment maintenance costs are one of the major expenses incurred by manufacturers. If done timely and on schedule, these costs can be reduced; issues can also be detected and fixed before equipment failure occurs. Manufacturers use ML applications to monitor for equipment performance degradation as well as other signs that indicate the need for preventative maintenance. Productivity: Using numerous data points, ML can assess a manufacturer’s overall productivity. It can point out areas that are having a negative impact on the manufacturer’s productivity and provide recommendations to boost productivity. Media content compliance: Some countries have restrictions regarding what type of content can be broadcast through television or disseminated online. Some of the restrictions placed by these countries include substance abuse, violence, adult content, or strong language, among others; media companies that fail to abide by these restrictions may incur steep fines or other severe penalties. With restrictions typically varying by country, media companies traditionally spend time as well as money filtering their content to ensure compliance with local regulations. Using ML, media companies are able to automatically curate their content and ensure that they are compliant with relevant regulations. Video captions: Traditional methods of transcribing movies and other videos so as to generate captions in multiple languages are usually expensive as well as time-consuming and prone to inaccuracies. Using ML algorithms, media companies are able to automate the process of analyzing and creating video captions in the desired languages, saving time and money by so doing. Medical diagnosis: Healthcare providers are increasingly using ML to enhance their diagnostic capabilities. ML algorithms are able to analyze patients’ previous medical records and assess for signs of chronic disease. In addition, ML is able to identify conditions that may result in hospital readmissions so that appropriate preventative measures can be taken. Furthermore, ML can be used in the diagnosis of cancers and other medical conditions that are difficult to diagnose. Administrative workflows: ML applications are used by healthcare providers to simplify some of their administrative tasks. Voice-to-text ML applications enable providers to dictate their notes and orders which are then transcribed into patient charts. ML programs are also able to schedule appointments for patients as well as send appointment reminders. At Zazmic, we are specialists in using the Google Cloud platform to help our clients develop their cloud infrastructure. Having recently become a Google Cloud Premier Partner, we are a trusted resource in providing innovative ML solutions for companies to enhance their business processes using Google Cloud tools and applications. With our many years of experience, you can count on our team of Google Cloud certified engineers and Architects to developing customized ML solutions to suit your business need, regardless of the industry. Contact us for more information about how you can use our ML solutions to grow your business processes.